Now that the US has exploded its first hydrogen bomb, a negotiated peace with the Soviet Union is more important than ever. Hiroshima, a month after the first atomic bomb was dropped by the US to hasten Japan’s surrender. This article appeared in the November 29, 1952 edition of The Nation. The announcement that the atomic age has now given birth to the H-bomb, said to be a thousand times more destructive than the 1945 A-bomb, must be considered in the light of several major realizations. On October 26, 1952, John Foster Dulles, President-elect Eisenhower’s new Secretary of State, and Dr. Arthur H. Compton, in interviews with Richard G. Baumhoff of the St. Louis Port-Dispatch, agreed that it is now too late to outlaw or abandon the use of atomic weapons. Doubtless both men spoke in the knowledge that the explosion of the H-bomb would shortly be announced. This was the first time, Mr. Dulles said, that he had expressed himself on the subject of outlawing atomic arms: his position is simply that there is no valid reason to differentiate between atomic and other weapons. 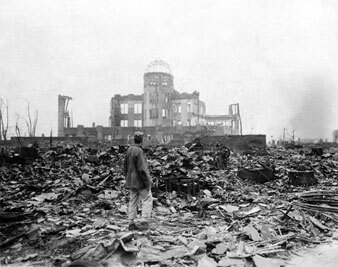 On the basis of his personal inspection of war damage in Tokyo, Hiroshima, and Nagasaki, he believes that "the atomic bomb is a much more merciful death" than that caused, say, by the type of fire bombs used in raids on Tokyo. "The whole effort of every military establishment" he said, "is to increase its ability to kill and destroy." Hence the outlawing of nuclear weapons is neither necessary nor practical. Nor can there be any general effective regulation of armament without international control so great as to constitute, in effect, a world government. Since Russia would accept only a Communist world government, armament control becomes impossible. The best hope, he feels, is that the increasing destructiveness of war will operate to discourage war. Speaking as a scientist, Dr. Compton said that he concluded as early as June, 1950, that it was no longer feasible to exclude the use of atomic weapons even by agreement. Militarily, as he sees it, the abandonment of atomic weapons would place us at a disadvantage in relation to Russia, since in case of war Russia could strike hard close to its borders, while our heavy blows would have to be delivered at "points remote from the home place." From the technical point of view, the situation is simply that possession or even production of atomic weapons can now be so effectively concealed that not even the most careful system of inspection could uncover it. Dr. Compton said that he knew of no way, nor had he ever heard anyone suggest a way, by which hidden stockpiles might be located. Furthermore, work on the use of uranium for the production of atomic industrial power has now gone so far that it would be exceedingly difficult to differentiate between peaceable and potentially warlike uses of atomic energy. "The thought of the Baruch report," he said, "was that one could trace uranium and its use. However, in the years that have elapsed since the report every nation presumably has acquired its stockpile of uranium. It is no longer possible to trace where uranium is mined; it has already been mined, and where it has been put would be impossible to tell," Brigadier General Thomas R. Phillips (retired), military analyst for the Post-Dispatch, confirms this judgment. "Atomic disarmament is no longer possible— such is the belief of many responsible officials, both civilian and military, in the Pentagon." Fissionable material has become, in the military view, "just another, and tremendously powerful, high explosive. It no longer only powers a weapon of mass destruction but has given birth to a whole family of atomic weapons"—atomic artillery, atomic guided rockets, atomic anti-aircraft. In the period since the Baruch report was released we seem to have lost the opportunity not only to outlaw atomic warfare and police atomic development but also to keep the use of atomic energy for peaceful purposes under civilian control. Michael Amrine, formerly publications editor for the Federation of American Scientists, calls attention to the fact that a curious forty-ninth state has come into being, a state about the size of Delaware, consisting of the various atomic installations. This new state lies behind "high fences, locked gates, and armed guards" and is for all practical purposes not subject to local control; in effect it has even passed out of the control of the civilian federal agencies. In 1953 the Atomic Energy Commission plans to spend, according to, Mr. Amrine, almost $4,000,000,000, of which nearly 95 per cent will be for "secret" purposes. How effective is civilian control of atomic energy when the screen of secrecy is so dense that only a few civilians can obtain the information essential to the making of basic policy decisions? "Secrecy," as Mr. Amrine notes, "presents some very strange problems to a democracy." Scientific advances in the field of atomic energy have outpaced political thought in the last five years and greatly complicated the immediate military problem. Our Atlantic allies will insist now more than ever that the scale and tempo of rearmament can be safely reduced. The explosion of the first British atomic-bomb on October 3 will encourage this belief. At the same time, the realization that we are more vulnerable than the Soviet Union to atomic attack—since American industry is more concentrated than Russian—will add to our uneasiness, and this uneasiness will become acute indeed when the Russians announce, as they will eventually, that they too have the H-bomb. In the meantime, our possession of the H-bomb will encourage the preventive-war enthusiasts to believe that now is the time to force a showdown. To these enthusiasts, as Ned Russell has pointed out in the New York Herald Tribune the H-bomb will seem "the pistol on the table" which has finally created the "situation of strength" upon which an ultimatum might be based. If atomic bombs cannot be outlawed—and at the moment there is little ground for optimism on this score—then the only advantage we should gain from using them would be in pressing whatever initial advantage we possess. The experts will say that the Russians cannot be far behind us; therefore the conclusion is likely to be drawn that if war is inevitable in any case, we should take the initiative while we still have the advantage. All of this rests, however, on the assumption that a negotiated peace is not feasible—an assumption which The Nation has steadily refused to accept. Perhaps atomic warfare cannot be outlawed at this time, but that does not mean that limited agreements with the Russians cannot be made or that a general settlement is unthinkable. In a sense, the earlier negotiations over the control of atomic energy may have complicated the problem of reaching a general settlement. On the other hand, each atomic development emphasizes the necessity for reaching political agreements that will reduce the existing tension, since each one heightens the tension. Aside from a negotiated settlement, however, there is another possibility, and one which permits us to seize the initiative. Paradoxically, the best chance of preventing a general war, in which atomic weapons would surely be used, may now be found in the use of atomic energy as the major key to a world-wide rehabilitation and reconstruction effort, particularly in its use to telescope stages in the economic development of backward areas. Fear of the destructiveness of modern war can only be a temporary deterrent, since fear rules out security. But if a new era of abundance could be ushered in, on a time schedule based not on centuries but on decades, it might be possible to create a feeling of security which would permit nations to discuss worldwide disarmament and world government with some hope of reaching agreement. A partnership in plenty would be the strongest guaranty of collective security against war.